There's a storm coming, Agent Hotchner. And you're about to be swept away. 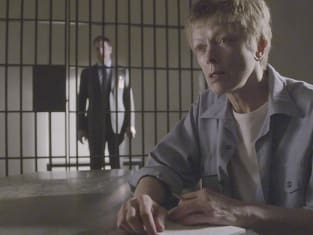 Criminal Minds Season 11 Episode 21: "Devil's Backbone"
Hotch: You sent the events of the last few days in motion for a reason. Antonia: And you want me to tell you what it is. Well...you're going to have prove you've got a little bit more going on than a fancy title and nice suits to deserve an answer. Hotch: When you were 14, you missed almost a year of school, due to an unspecified illness. During the same year, a 15 year old boy on a neighbouring farm was killed in a hunting accident. I think these two events were related. You weren't ill, you were pregnant. And the neighbor boy was the father of your child. Your father, the German minister, the authoritarian, punished you for breaking the rules. He made you have the baby at home, and he murdered your boyfriend. Hotch: At first we profiled you as an extreme narcissist, but that's just a cover up. You're actually full of self-loathing, and every time you killed a runaway teen, you were killing yourself or your boyfriend for lacking discipline.